Chandler, AZ, December 9, 2015 — Feeling the need for speed? 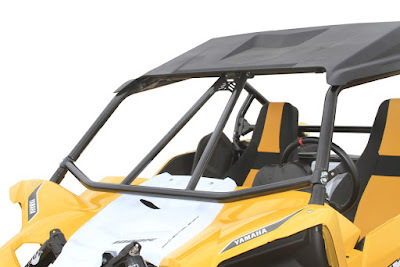 Pure performance is the name of the game for Yamaha’s hot new YXZ1000R, so we thought it was time to help accelerate to RacePace! DragonFire is pleased to announce the popular “Flying V” bar joins our ever expanding range of products for the new Yamaha. Like all RacePace products the totally modular design means no cutting or welding is necessary for installation. Integrated gussets with built-in features like accessory mounts for cameras and rear view mirrors makes DragonFire’s Flying V one-of-a-kind! “Hopefully you never need it,” concludes Chris. “But if you do, DragonFire’s RacePace Flying V bar has you covered!” Get more details at the DragonFire website www.dragonfireracing.com …and Accelerate To RacePace!